This is a small article about the guitar mult-effects pedal Roland ME-80. The pros and cons of the instrument have also been listed in this article. Hope this is useful in selecting the best guitar multi-effects pedal for you. 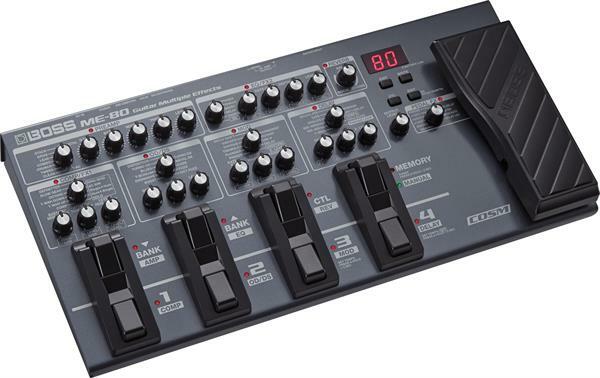 This article is about the musical accessory for your guitar, Multi-Effects pedal BOSS ME-80. I have tried to be honest with my view on the instrument. This is my personal view on this instrument and is not influenced by anyone. Hope this article is informative enough for the reader and hope it gives valuable insight on using the instrument. Most of the Multi-Effects pedals available in market are very complex, hard to use. Many guitarists are afraid to work with multi-effects pedals because of the time to set up everything is short. They prefer stompboxes for ease of use. But with ME-80, Boss has made it very easy to use; it is as easy as using few stompboxes. However, they have still managed to add most of the advantages of the multi-effects pedals. The ME – 80 has a compact and sturdy design. The new design of the footswitch fits two switches in the space of one. Has a very eye catchy design and helps in with the ease of use. Is lightweight which makes it easier to carry around for your concerts in your frequent travelling schedule. A footswitch is dedicated for switching between Manual and Memory mode. In manual mode the ME-80 acts as 4 different stompboxes. In memory mode you can select between different banks and patches. The Interface of ME-80 is very user friendly. ME-80 has many effects like Phaser, Tera Echo, reverb, harmonist, etc. Eight of these effects can be used simultaneously. Unlike most of the multi-effects pedal in the market which has a set of knobs for all of the effects, ME-80 has separate knobs for each effect, which makes it less complex and easy to understand. There are eight footswitches on the ME-80. 7 of them are used for different purposes in Manual or Memory mode. In Memory mode, the two footswitches on the top left are used for switching between banks. The four footswitches nearest to you are used to switch between patches. In Manual mode, the three footswitch on the top left are used as bypass switches Preamp, Equalizer/FX2, and Reverb. And the four footswitches nearest to you are used as bypass switches for Comp/FX1, Overdrive/Distortion, Modulation, Delay. The expression pedal can be used for 10 effects like -1 octave, +1 octave, +2 octaves, Wah and Freeze. ME-80 uses a 24bit analog to digital conversion with adaptive focus method, which significantly reduces the signal to noise ratio. ME-80 has the boss's Multi-dimensional processing technology, which can be seen in the spacious Tera echo or the overtone two delays can be used at the same time, which can be used to create ambient sounds. ME-80 also has COSM (Composite Object Sound Modeling) technology. This improves the sound quality of this processor. This technology precisely recreates the electronic, mechanical and magnetic characteristic of the real amps or classic stompboxes present in this processor. If you want to create a backing track live on the stage in no time or just for practicing, you can use the phrase loop function of the ME-80. The phrase loop function is a maximum 38 second recorded audio. You can also overdub the audio, which will be useful in many situations like, creating a bass track and backing chords. Want to record a backing track for your performance, but tired of going through the complex process of setting your whole recording system. The USB audio/MIDI interface on this pedal can be a perfect solution. You can record your audio by simply plugging in your guitar, and connecting the USB to the PC or Mac. Boss Tone Studio is a powerful software which is available for free download from www.boss.info. You can use it to save, edit and organize your sounds. You can tweak the patches of this pedal with your PC or Mac using a great graphical interface. You can even preview and download great patches made by top guitarists. ME-80 even has a built-in chromatic tuner, this will eliminate the need of carrying a tuner everywhere or tuning your guitar by ear. The tuner can be accessed by pressing and holding the Manual/Memory mode switch for more than 2 sec. it runs on 6 AA type batteries or a boss PSA series power adapter. Headphones can also be attached to this pedal. Some high-gain sounds have a little harsh (hard clipping) sound.